economic justice in the international community, creating a society for the greater good of all humanity. We envision a society for the betterment of all peoples, planting seeds of hope and love to heal a Divided Nation and International Community now and into the future. Chamber of the Americas Foundation (COTA) is now embarking on a new and exciting endeavor by taking its 25 years of navigating international waters of trade and economic development to another level to heal a Divided Nation and International Community now and into the future. • To plant seeds of hope and love and to create a society for the greater good of all humanity with our outreach program, "You Are the Difference." • To embark on diverse a grassroots campaign through special events, town halls, seminars and social media, interacting with leadership, corporations, nonprofits, institutions, and women and men everywhere. • To initiate an introspective Journey to stimulate, not dictate, opportunity so one by one we can change the standards and values of the world for the betterment of all peoples. 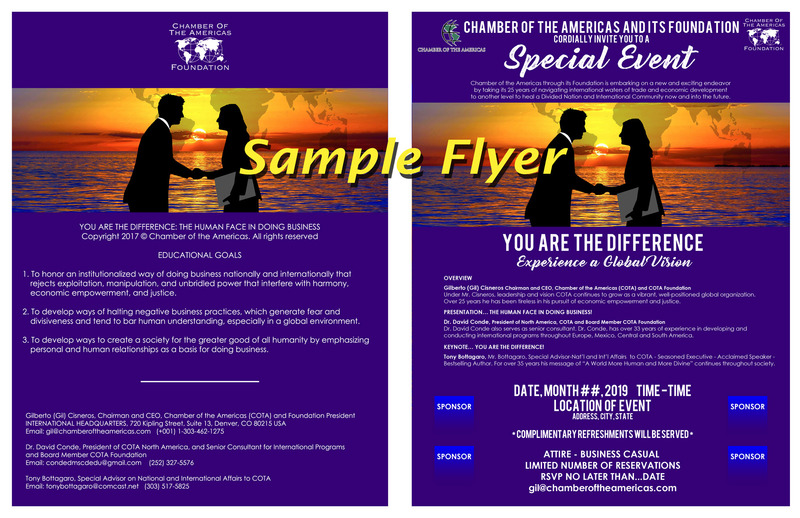 • To take COTA's educational module and program, "You Are the Difference: The Human Face in Doing Business," nationally and internationally to universities and colleges, corporations and institutions through webinars and seminars. The purpose of the educational module is to study and discuss opportunities to change the standards and values that make business worldwide have a more human face, accompanied by a positive attitude about economic justice and human relations. We deeply appreciate your finanical support in helping to make possible COTA's objective to provide, without cost, its education module to universities, colleges and other initiatives that wish to incorporate the module into their existing programs. tonybottagaro@comcast.net for more information. Pictured below is a sample flyer.